Environmental Friendly,Energy And Money Saving. NH-AA2200BC Environmental Friendly,Energy And Money Saving. These batteries are rechargeable up to 1000 times.So these are a Considerable Savings on your investment.As these batteries are rechargeable more times they also reduce the pollution made bye destroying normal Alkaline Batteries.These are Ideal battery for powering today's high-tech equipments. 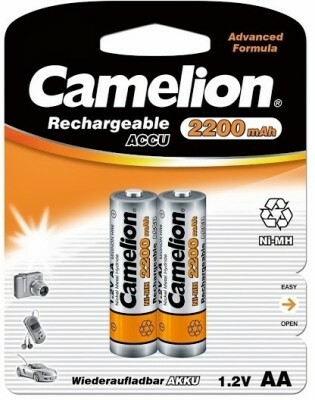 To Recieve updates and possible rewards for Camelion AA 2200 mAh Accu please sign in. To Recieve updates and possible rewards for Rechargeable Battery please sign in.